It’s been a while. Despite the length of time and lack of posts, rest assured a significant amount of progress has been made on my VHDL CPU over the last year. I’ve hinted at that fact multiple times on twitter, as various project milestones have been hit. But what’s changed? First and foremost; the CPU now consumes RISC-V. It’s decoder, ALU and datapaths have been updated. With that, the data width is now 32 bit. The Decoder accepts the RV32I base integer instruction set. I’d been putting off multiple side-projects with my existing TPU implementation for a while. It’s 16-bit nature really made integrating the 32MB SDRAM into the system a rather pointless affair. I’m all for reminiscing but I did not want to go down the rabbit hole of memory bank switching and the baggage that would entail. The toolchain for creating software was already at the limit – not the limit in terms of what could be done – but the limit in what I’m prepared to do in order to perform basic tasks. We all love bare metal assembly, but for the sake of my own free time, I wanted to just drop some C in, and I was not going to make my own compiler. I looked into creating a backend for LLVM, but it’s really just another distraction. As a reminder, here is where we left off. So, what’s actually changed from the old 16-bit TPU? The register file is basically the exact same as before with the 16-bit TPU, extended for 32 entries of 32 bits names x0-x31. In RV32I, x0 is hardwired to 0x00000000. I’ve left it a real register entry, but just never allow a write to x0 to progress, keeping the entry always zero. 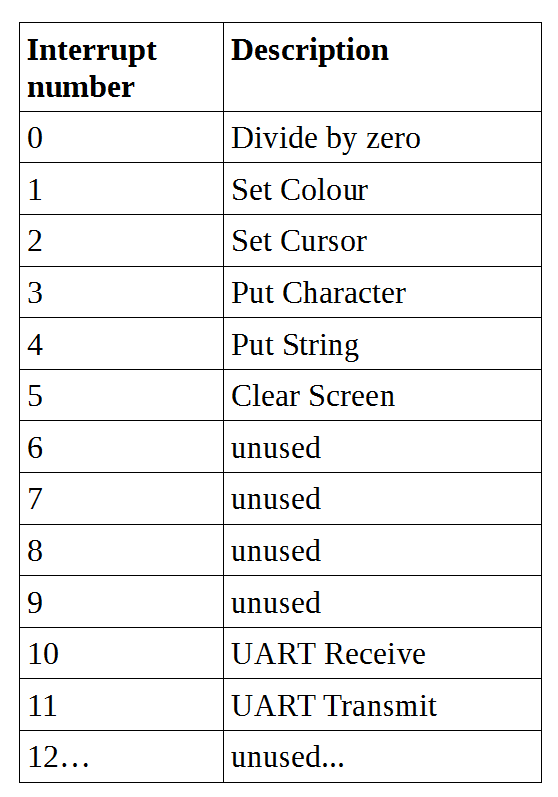 The decoder and ALU is fairly standard really – there are a small number of instruction formats, and where immediates are concerned there is some bit swapping here and there, but the sign bits are always in the same place which can make things a bit easier in terms of making the decode logic easier to understand. 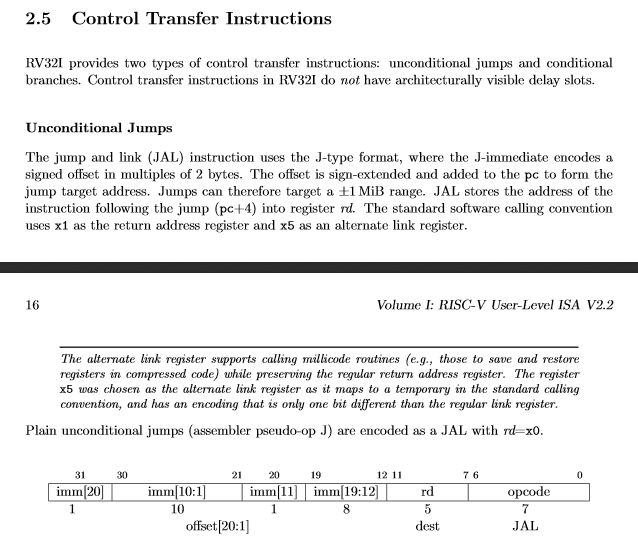 The last item about datapath changes follows on from how RISC-V branch instructions operate. TPU was always incredibly simple, which meant branching was quite an involved process when it came to function calling and attempting to get a standardized calling convention. There was no call instruction, and the amount of operations required for saving a calculated return from function address, setting up call arguments on the stack and eventually calling via an indirect register was rather irritating. With the limited amount of registers available on TPU, simplification via register parameter passing didn’t solve much as you would be required to save/restore register contents to the stack regardless. RISC-V has several branch instructions with significant changes to dataflow from that of TPU. In addition to calculating the branch target – which is all TPU was able to do, RISC-V calculates a return address at PC+4, which is then written to a register. This means our new ALU needs two outputs, the standard result of a calculation, and the branch target. The branch target with the shouldBranch output status feeds into our existing PC unit, with the result feeding as normal the register file/memory address logic. The new connections are shown below in yellow. In terms of old TPU systems, the old interrupt system needs significant updating and so is disabled. It’s still got block ram storage, UART, and relies on the same underlying memory subsystem, which in all honesty is super bloated and pretty poor. The memory system is currently my main focus – it’s still made up from a single large process at the CPU core clock. It reads like an imperative language function, which is not at all suitable for the CPU moving forward. 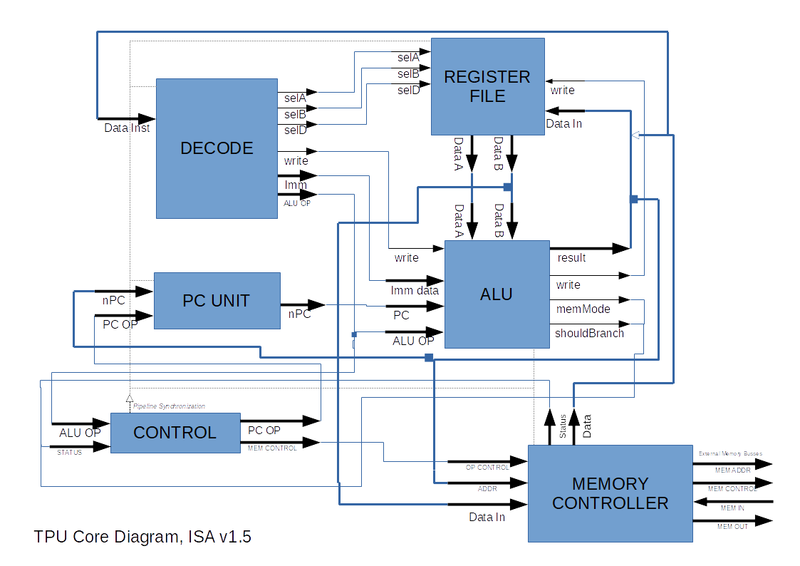 The CPU needs to interface with various different components, from the block rams, UART, to SPI and SDRAM controllers. These can be running at different clocks and the signals all need to remain valid across these systems. With everything being accessed as memory-mapped IO, the memory system is super important, and I’ve already run into several gotchas when extending it with an SDRAM controller. More information on that later. As I mentioned earlier, one of the main reasons for moving to RISC-V was toolchain considerations. I have been developing the software for my ‘soc’ with GCC. With Windows 10, you can now use the Linux Subsystem for Windows to build linux tools within Windows. This makes compiling the RISC-V toolchain for your particular ISA variant a super simple process. https://riscv.org/software-tools/ has some details of how to build relevant toolchains, and Microsoft have details of how to install the Linux Subsystem. With the RISC-V GCC toolchain built, targeting RV32I, I was able to write a decent amount of code in order to create a bootloader which existed inside the FPGA block ram. 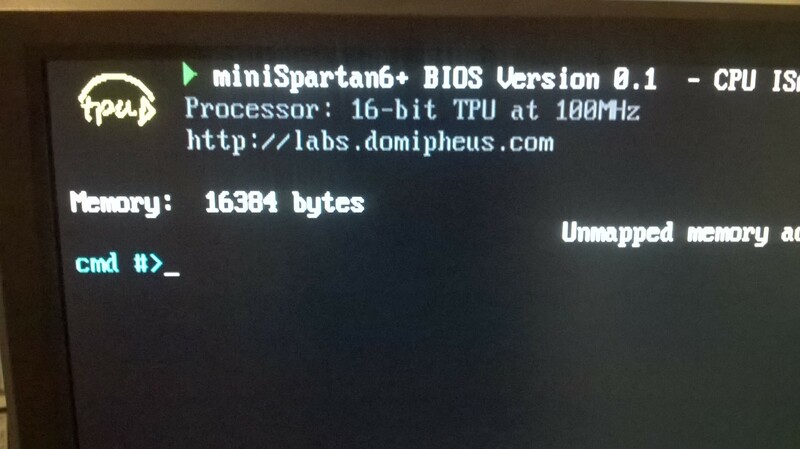 This bootloader looked for an SD card in the miniSpartan6+ SD card slot. It initialized the SD card into slow SPI transfer mode so we could get at it’s contents. Actually getting to data stored on an SD card is incredibly simple, and has been written up nicely here. In terms of how the CPU accessed the SD card, I found a SPI master VHDL module and threw it into my project, and memory mapped it so you could use it from the CPU. A few helper functions later, the bootloader did a very simple FAT32 root search for a file called BOOT, and copied it into ram before jumping to it. It also copied a file called BIOS to memory location 0x00000000 – which had a table of I/O functions so I could fix/extend functionality without needing to recompile my “user” code. With the FPGA set to look for this BOOT file off an SD card, testing various items became a whole lot easier. Not having to change the block ram and rebuild the FPGA configuration to run a set of tests saved lots of time, and I had a decent little setup going, however I was severely limited by RAM – many block rams were now in use, and yet I still did not have enough RAM. I could have optimized for space here and there, but when I have a 32MB SDRam chip on the FPGA dev board it seemed rather pointless. It was finally time to get the SDRAM integrated. 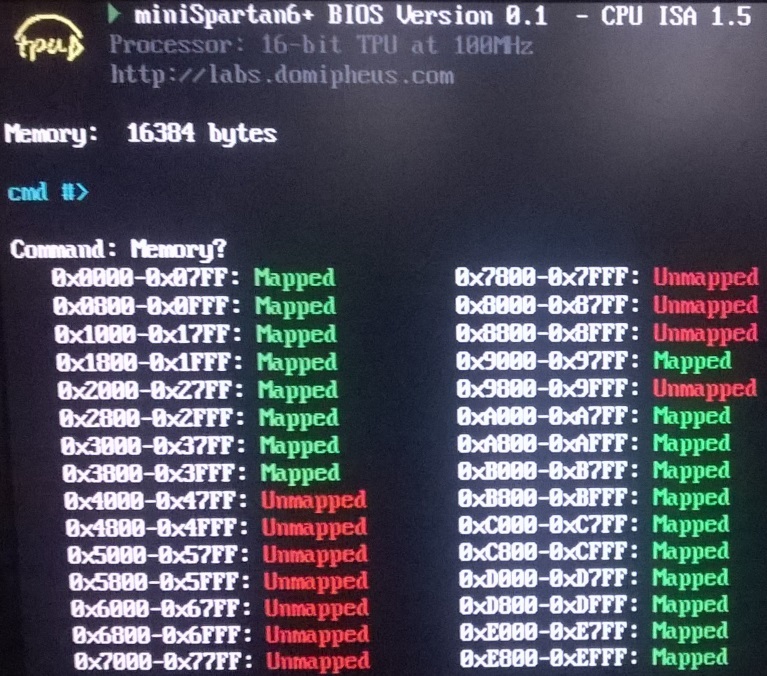 Getting an SDRAM interface controller for the chip on the miniSpartan6+ was very easy. Mike Field had done this already and made his code available. 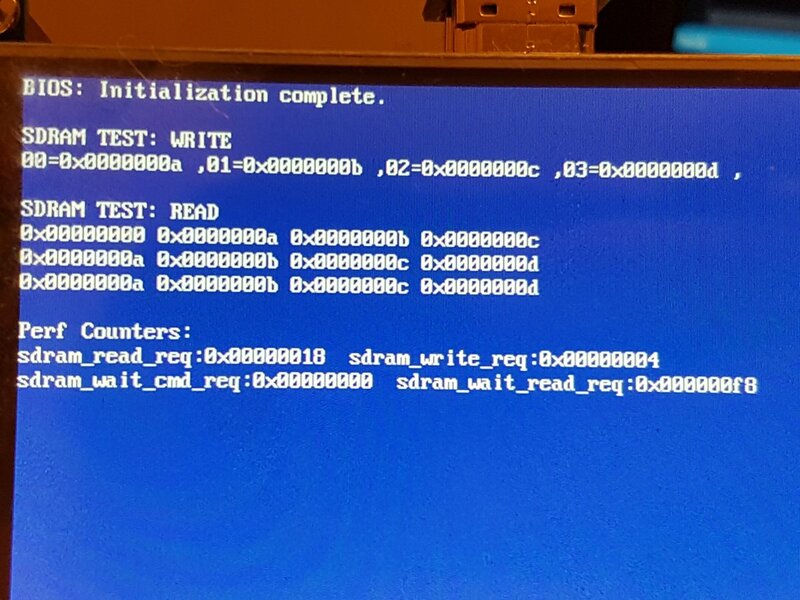 The problem was that whatever I tried, the data out from the SDRAM was garbage. Or, should I say, out by one. Everything to do with computers has an out by one at some point. Anyway, data was always arriving delayed by one request. If I asked to read data at 0x0000100, I’d get 0. If I asked for data at 0x0000104, I’d get the data at 0x00000100. I could tell that writing seemed to be fine – but reading was broken. Thankfully discovering this didn’t take too much time, due to being able to boot code off the SD card. I wrote little memory checking binaries and executed them via a UART command line, the debug data being displayed on the HDMI out. It was pretty cool, despite me getting wound up at how broken reading from the SDRAM was. It took a long time to track down the actual cause of this read corruption. For the most part, I thought it was timing based in the SDRAM controller. I edited the whole memory system multiple times, with no changes to the behavior. This should have been a red flag for me, as the issue was being caused by the constant through all of these tests – the RPU core! In RPU, the signals that comprise the input and output of each pipeline stage get passed around and moved from unit to unit each core clock. This is where my issue was – not the “external” memory controller! Despite my CPU being okay with waiting for the results of memory reads from a slower device, it was not set up for correctly forwarding that data on when the device eventually said the request had completed. A fairly basic error on my part, made harder to track down by the fact the old TPU CPU design and thus RPU had memory requests going through the ALU, then control unit, and some secondary smaller memory controller which didn’t really do anything apart from add further latency to the request. I fixed this, which immediately made all the SDRAM memory space available. Hurrah. It’s rather annoying this issue did not present itself sooner. There are already many “slow” memory mapped devices connected to the CPU core, but they generally work off of FIFOs – so despite them being slow, they are accessed via queries to lines to say whether there is data in the FIFO, and what the data is. These reads are actually pretty fast, the latency is eaten elsewhere – like spinning on a memory read. Basic SDRAM read latency however for this was in the 20 cycle range at 100MHz, way more than previously tested. Having the additional memory was great. Now that we have a full GCC toolchain, I could grab the FatFs library, and have a fully usable filesystem mounted from the SD card. Listing directories and printing the contents of files seemed like such a milestone. So that’s where we are at. However, things be changing. 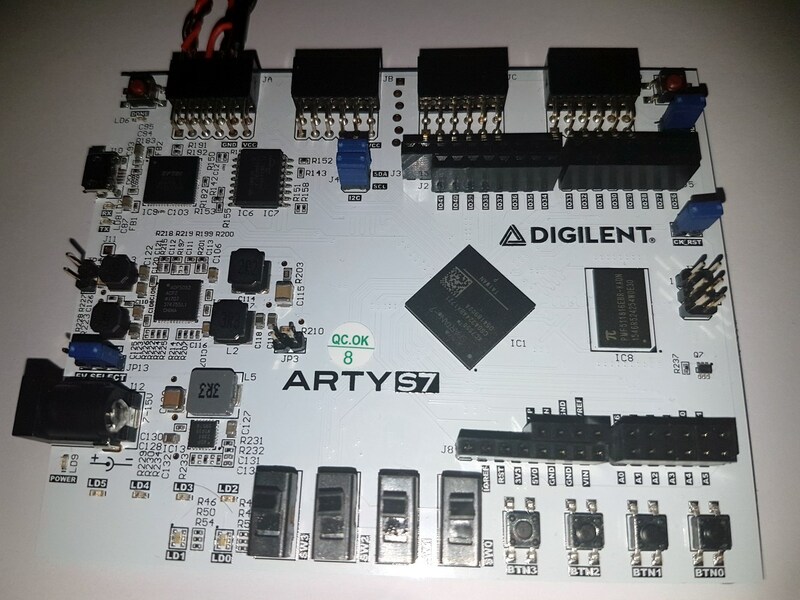 I have switched over to Xilinx Spartan 7, using a Digilent Arty S7 board (the larger XC7S50 variant). I’m currently porting my work over to it. If you saw my last blog post, you’d have seen that HDMI out at least works, and now I’m working on porting the CPU over, using block rams and SD card for memory/storage. Lastly will be a DDR3 memory controller. 256MB of 650MHz memory gives much more scope for messing up my timing even more. It should be great fun! I hope to document progress more frequently than over the past year. These articles are my projects documentation, and provides an outlet to confirm I actually understand my solutions, so the lack of posts has made things all the more disjoint. The next post shall be soon! Thanks for reading. Let me know of any queries on twitter @domipheus. This is an article on porting my VHDL character generator from a Xilinx Spartan6 device to one with a Spartan3. It starts off as a simple port, analyzing device primitive differences and accounting for them in the design. Along the way, there were considerations on how clocks were generated, characteristics of block ram timing, and general algorithmic design. I’ll assume you’ve read the sections of my Designing a CPU in VHDL series specifically detailing the implementation of the character generator. When I first attempted to synthesize my TPU CPU Core design on to the miniSpartan3 developer board (made by the great folks at Scarab Hardware), the bulk of the code went without a hitch. The processor core itself contains no primitive parts specific to a single vendor. However, the rest – Block Rams, Clock Generators – used instantiations of specific device primitives. These are different from family to family of FPGAs and those are where the most thought and investigation is needed, as changes can have knock-on impacts to operations further along the device path. High level device differences are fairly minimal. 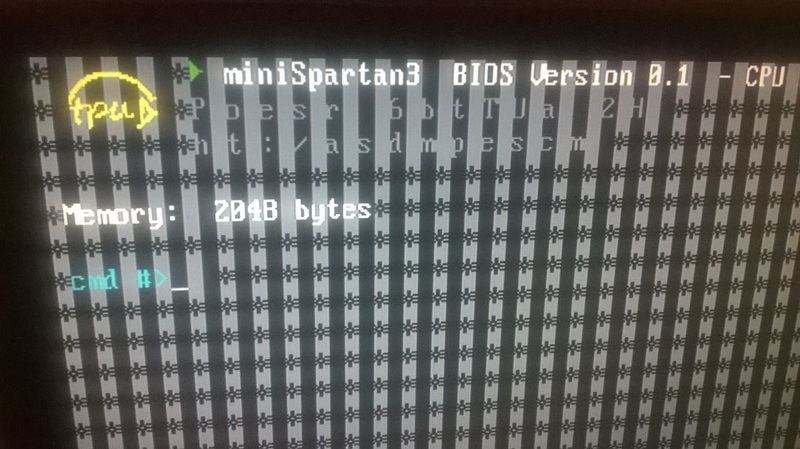 On the board itself, we have a 32MHz clock input on the miniSpartan3 board instead of the 50MHZ input on the miniSpartan6 setup. So we will need to change ratios of how we generate pixel and ram clocks for the DVI-D/HDMI video output. The FTDI chip for serial communication is similar and a communications channel is connected to the FPGA. We will need to change the constraints file for the pin definitions as well, but that’s always expected. The CPU Core and Read/Write Port A’s of all Block Rams use the CPU Core clock. The UART Baud Generator uses the Base Clock. The VGA/Graphics signal generator uses the Pixel clock. The TMDS/DVI-D/HDMI encoders and output buffers use the 5x Pixel and 5x Pixel Inverted clocks. The Character generator, and relevant Port B block rams (Text and Font Rams) use the Char/Text Clock. When porting to Spartan3, we need to use Digital Clock Managers (DCMs) instead of the Phase Locked Loops (PLLs) on Spartan6. The interface to DCMs is considerably different, but the base terms remain and you can understand what needs to change in the design without much thought. 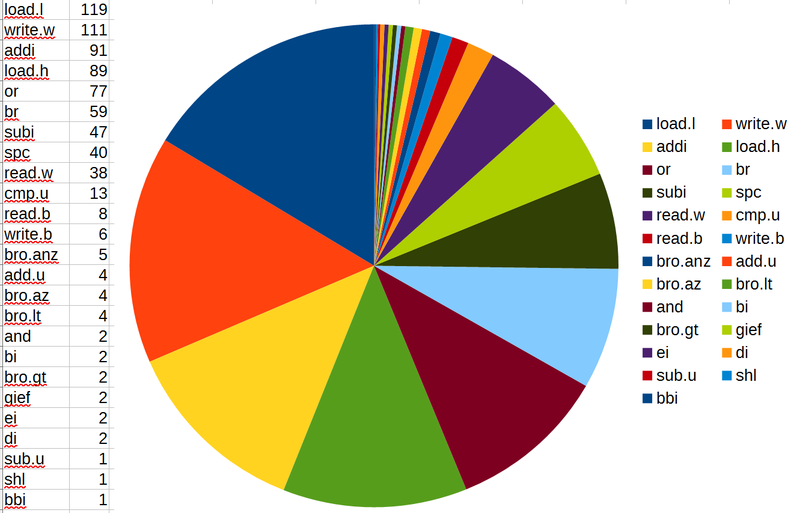 One of the main issues is that DCMs have much less outputs than the PLLs. 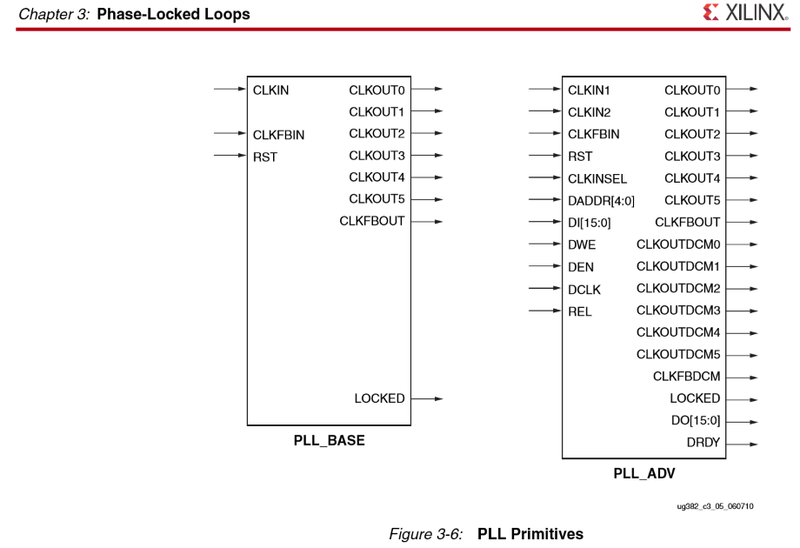 On the Spartan6 implementation, a single PLL primitive is used to drive all of the different clocks require. On Spartan3, we will need a DCM for each frequency. Due to this, we will require 3 DCM objects. Our Spartan3 chip XC3S200A only has 4 in total, so we are using a significant amount of resources to generate these clocks. However, we do have the available DCMs to get started immediately. The DCMs themselves have multiple configurations to set up. We use the clock synthesizer(DFS) to get our 25MHz pixel clock from our 32MHz input. The maximum rangers for the DFS is outlined in the Spartan-3A datasheet. To generate the pixel clock, we multiply our 32MHz input by 15 to 480MHz then divide by 19 to get 25.2MHz. 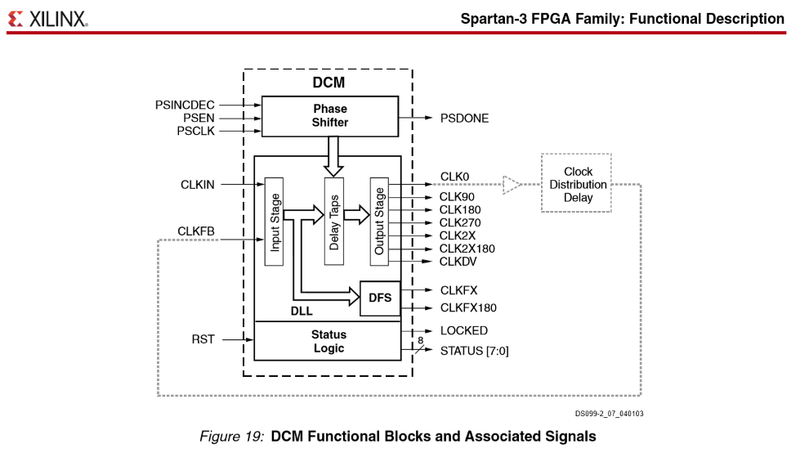 CLKOUT_PHASE_SHIFT => "NONE", --  Specify phase shift of "NONE", "FIXED" or "VARIABLE"
CLK_FEEDBACK => "1X",         --  Specify clock feedback of "NONE", "1X" or "2X"
The block rams on Spartan3 are very similar to the Spartan6 counterparts. They do have different characteristics in terms of timings and therefore maximum operating frequency. 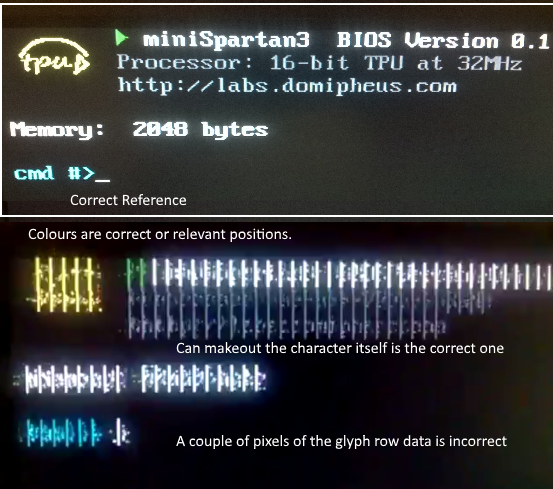 The Block Ram primitives on my Spartan3 are not rated for the ~260MHz that those on the Spartan6 run at – so there will be changes required to the Character generator as to account for additional latency in the memory operations. Thankfully, Xilinx provide the PicoBlaze UART objects for Spartan3 a they do for Spartan6, so there was very little work required in porting these over, apart from using different library objects. The Baud clock routine was changed to strobe correctly using the 32MHz base clock instead of 50MHz on the miniSpartan6. That was the only significant change here. The OBUFDS output buffers used before can be used on Spartan3, along with the ODDR2 Double Data Rate registers for generating the 10x HDMI signalling. Most work was on the Character Generator. This was due to the base algorithm of the system needing slight amendments to account for the increased memory latencies and slower clocks. However, I think it’s useful to see what things can happen if we ignore all of that for a second, and simply ‘blind port’ the system ignoring the rated maximum frequencies, just to see what happens. There are a few points of interest that you can take from this footage. I’ve singled out a frame to identify them easier. The corruption while random occurs in X directions, as there are bars which are consistent across character locations. As we can tell that the character along with the colour is correct, we know it’s not data corruption in transfer. However, the vertical banding is occurring at the start of the character, indicating the glyph row data is not getting to the system in time. In this situation I went to the datasheets and application notes to find maximum frequency ratings for the clock synthesizers and block rams. The 250MHz char/pixel clock is well within specification for generation, but the block rams are only rated for 200MHz. Instead of attempting to redesign the character generator to run off a new slightly slower clock (200MHz), I started modifying it so that it would operate correctly at the 5x pixel serialization clock – as this would free up another DCM object and reduce our utilization from 3 to 2. The way I started with this problem was to delay the character generator by a single pixel, allowing to pipeline the memory requests up over two pixels instead of one. This would then give us the 10 sub-cycles per pixel. 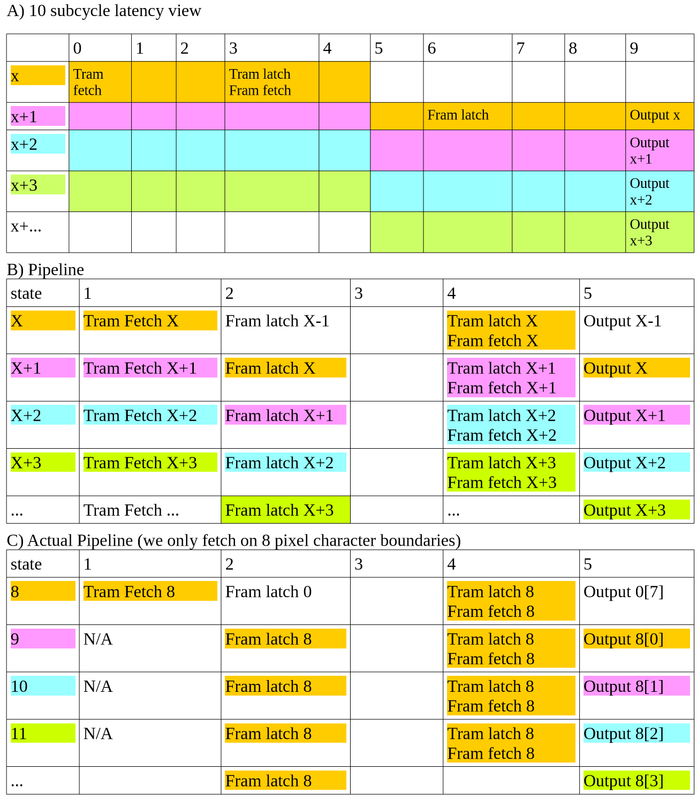 Table A) shows how 10 sub-cycles are required, table B) shows how they would fit together into a pipelined 5 sub-cycle state machine and C) shows that optimized, as certain stages need only occur when you crossover into a new character. The latching and fetching of the glyph data is idempotent and does not incur additional costs, as the tram data which derives the addresses for glyph rows is only fetched on each 8-pixel character transition. 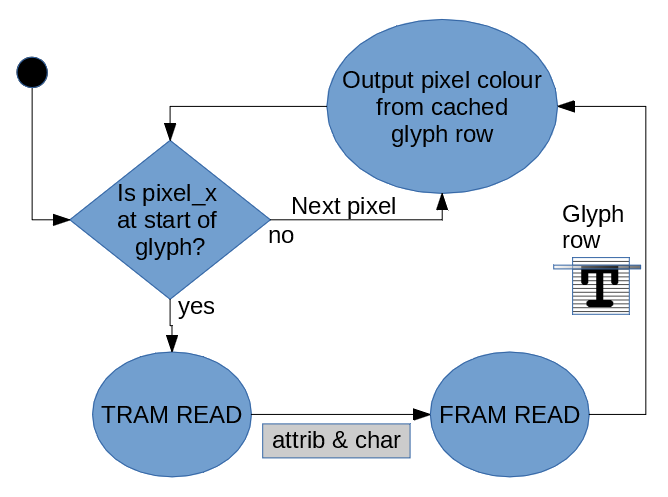 My first implementation of this seemed to work well enough, apart from there being a duplicated pixel in the glyph. It is harder than you’d think to tell whether this duplicated pixel was at the start or end of glyph processing, so I forced the background colour of the screen to flip-flop between character locations as they were output, allowing you to see the specific zone that a glyph should reside within. From here, I could tell it was the first pixel which was causing the problem. The first one encapsulates all memory requests – with the further 7 pixels in a glyph row only utilizing a cached version of the data, so from here it was time to go into the simulator and look at some internal signals. The first thing to notice was there was disparity between the pixel x coordinate and the actual pixel/5x pixel clocks. Due to the pixel operations being driven from the 5x clock, there could be instances where mid-request there was changes in coordinates. The way to fix this was to have a process driven off of the pixel clock, which then latched the X and Y coordinates, which then the various other logic driven from the 5x clock could utilize. You can see in the above waveform the issue clearly. At (a) we kick off a new initial glyph row request (State 1 is only ever entered on the first pixel of a character row). If we do not latch the coordinate, half way though the request at (b) we could have the coordinate flip. Since we already had a process running from the pixel clock to manage the blinker flags, this was a simple addition. -- Also manages the blinker. The last issue was a really irritating one. Irritating as it was a very basic bug in my code. A simple state < 4 check should have been <= 4, meaning the 4 state prolonged an additional cycle, throwing the first pixel off. Easily fixed, and easily spotted in the simulator. We now have the character generator running off of a 5x pixel clock, with the font/text ram read ports also running at that slower clock. As well as allowing us to run to the Spartan3 FPGA specs of the device I have, it will additionally allow for higher resolutions in the future – especially on the Spartan6 variant. Thanks for reading, let me know what you think on Twitter @domipheus. It’s finally that time! I have committed the latest TPU VHDL, assembler and ISA to my github repository. Fair warning: The assembler is _horrid_. The VHDL contains a ISE project for the LX25 miniSpartan6+ variant, but the font ROM is empty. The font ROM I’ve been testing with doesn’t have a license attached and I don’t want to blindly add it here. You can, however simulate with ISim, and directly inspect the Text Ram blocks in ASCII mode to see any text displayed. I will explain that more later in the part. So just now we have a TPU program which prints a splash message, checks for the size of the contiguous memory area from 0x0000 (slowly), and then waits for a command from the input UART. This UART is connected to the FTDI chip on port B, so appears as a COM port to a computer when the USB cable is connected to the miniSpartan6+. It only accepts a single character command just now, mainly because I have chosen the path of progress here rather than the path of lovely command-line words, which involves several string functions that honestly nobody should need to waste time writing (yes, looking at you, tech interviewers). Getting to this point, without even writing significant code to handle a command, I realized that the code was so big (~1.5KB) that I’d have trouble fitting it into a single block ram. TASM, the Tpu ASseMbler, currently only outputs a single block ram initializer, and the VDHL duplicates that single intializer across each memory bank, so it would be a lot of work to fix all of that. I instead wanted to look at why exactly there is so much code, for such little functionality. So you look at that and scan for counts that don’t make any sense, there are a few that jump right out. For instance, Branch Immediate (bi) only used twice in all this code? 1400 lines of assembly and only 2 branch immediates? When investigating the code, I realized why. The 16 bit op codes don’t leave a lot of room for immediate values, even if they are shifted to account for 2-byte alignment of instructions. To play it safe, I was instead loading into the high and low bytes of registers, and branching to a register. So 4 instructions (load.l, load.h, or, br) instead of a single branch immediate. There were also lots of function calls, and those branches were performed using Branch Register. More puzzling was the differences in write.w and read.w count. 111 write words, versus 38 read words? Given most of the reads and writes in the code was stack manipulation for the various function calls, it seemed like there was significant overspill saving registers that were then not required to be read (basically, myself being over cautious). First, I would remove the Branch Immediate instruction, replacing it with a Branch Immediate Relative Offset. This will allow for the largest possible range, and help with eventual Position Independent Code, as the immediate is a signed offset from the current program counter. Perfect for use when jumping around inside functions. Second, I will introduce an interrupt instruction, int. This will allow for the software-defined invocation of the interrupt handler, with an immediate value being provided to the Interrupt Event Field. Then I will be able to replicate the old IBM/DOS BIOS routines – where interrupts were signaled to perform low-level tasks. 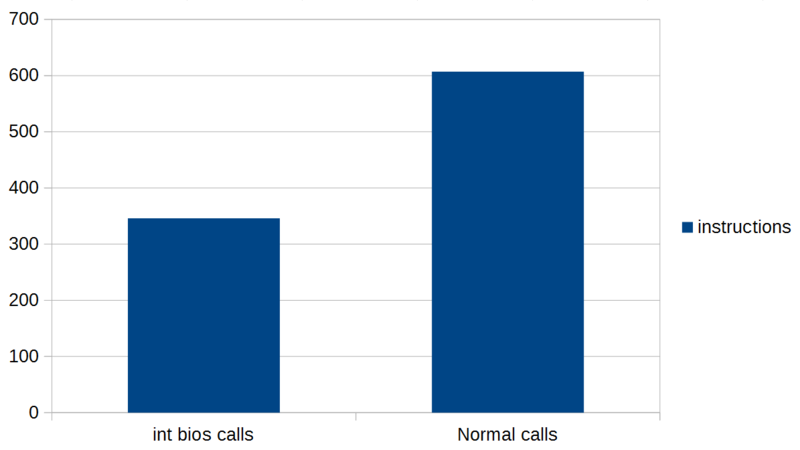 So lots of writes and bloat for every call, but it works well enough. I have return values passed back in registers. By implementing BIOS routines for these I/O functions using software interrupts, we should reduce the code size considerably. 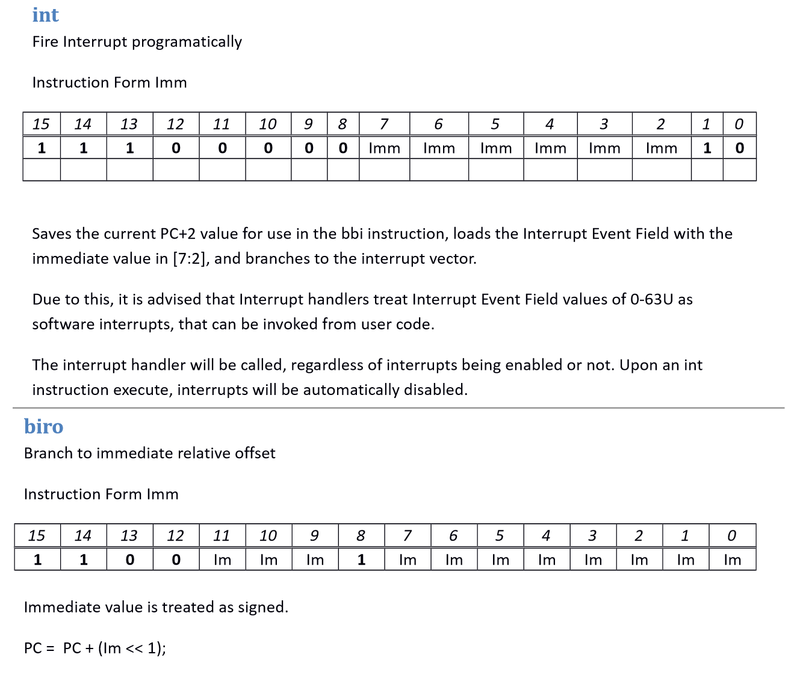 The new int instruction allows user code to jump into the interrupt handler, with a user-defined Interrupt Event Field. The space in the immediate area of the opcode allows for 64 values, so we define Interrupt Event Field values less than 64 to be only applicable to software routines. So the basics are there just now. Enough to make a test with input from UART and output to text-mode display. Note the division by zero entry – there is no hardware divide. I have a naive division function, and throws int 0‘s when division by zero is encountered. There are obviously restrictions to this; for example, you really should not use the int instruction when inside of an interrupt handler, but it can happen, nothing stops you from doing it. Keeping to these restrictions will be tricky. I have started looking at how the hardware can disable/restore interrupt enable states and also handle when an invalid int instruction is encountered. I went and moved all the code of my simple bios example over to this new system based on software interrupts. I also changed Branch Immediates to Branch Immediate Relative Offset, but didn’t fish out other opportunities for it significantly. The output on screen was corrupt. data was being clobbered somewhere, so I needed to debug..
TPU does not have debugging functionality for the software running on it, but, you can use the ISIM simulator, and edit the assembly code to at least allow for some ‘what are the registers at point X’ information. It is incredibly time consuming, but invaluable when things go wrong, which inevitably did when I tried out using the int instruction. I’ve mentioned in previous parts than in ISim you can inspect the contents of the internal Block Ram memories and other signals. This allows you to see register values, and the contents of the text ram. You can set up the data view to show ASCII, and get a representation of the characters you’d want displayed. What I tend to do is place a branch to self such as “biro 0” where I want to inspect registers, then run the code in the simulator. I could also use the TPU emulator, but I’ve yet to implement the full set of opcodes in it yet. Doing this around various places led me to discover that the r0 register was being overwritten on execution of int instructions. The value written was always 0x0008 – which to those who have read all previous TPU parts may recognize as the interrupt vector. The way the ALU works is that various signals are always calculated and made available, but then the relevant one is selected, usually by a signal from the decoder. The instruction is implemented in the ALU simply – like a standard branch. If s_shouldBranch is ‘1’, the PC unit takes the next PC from the output of the ALU, which is s_result(15 downto 0) – the Interrupt Vector ADDR_INTVEC (0x0008). You can see that the bits where a destination register should be (11-8) in an Rd-form instruction are all 0. The issue we have is that register r0 is having 8 written to it after an int instruction, and in the same way a branch uses the output of the ALU, if a register write is requested, the same value – the output of the ALU – will be used as the source data. With O_regDwe not being set in the event of the OPCODE_SPEC_F2_INT case, it would preserve it’s previous state. Before the int instruction as usually an immediate load into a register – meaning the regDwe signal would be left enabled, and produce the exact incorrect behavior I saw. Quickly adding the case for our new INT instruction, things worked perfectly. Now that we have the int instruction, I collated the number of instructions for the same functions, and got the expected reduction in code size. With this edit in place, multiple memory violation interrupt requests can take place. This is required for some code that I wrote which displays the ‘memory map’ of the system. A read is performed at each 2KB boundary, and if an interrupt violation is encountered it is assumed the whole bank/block is unmapped. This continues until all 32 banks are checked – and displays this to the screen as it happens. Getting back to the start of this post, where we discussed simple command execution, this memory map prints out if the ‘m’ command is entered through the UART. There are two other commands currently, ‘l’ for lighting all LEDs and ‘d’ for darkening them. There is also a current issue where UART input seems to generate multiple instances of the same character from my read function. I’ve yet to look at that problem in detail just yet. So in this part, we’ve investigated some ‘BIOS’ code, modified the branch immediate instruction, added a software interrupt instruction, and fixed some issues in their implementation. At the moment, I’m finding the hardest part of TPU now bad tooling. TASM for assembling code was good and served its purpose when I needed a quick fix for generating small tests. However, now that I’m thinking of sending program code over UART which is ‘compiled’ as position independent code, TASM is showing significant weaknesses. I’ll need to get around that somehow. For now that’s the end of this part. Many thanks for reading. As always, if you have any comments of queries, please grab me on twitter @domipheus. Now we have text-mode HDMI/DVI-D output, it’s about time we started writing more code for TPU. However, we’ve not delved into too much detail yet about the memory subsystem – the part of the puzzle which reinterprets the various busses from the TPU module in VHDL and manages how data flows between different memories and/or mapped ‘registers’. TPU has an address bus output, a data input bus and a data output bus. Generally CPUs have a single data bus and it’s bidirectional, but I opted for this current setup early on and have stuck with it. 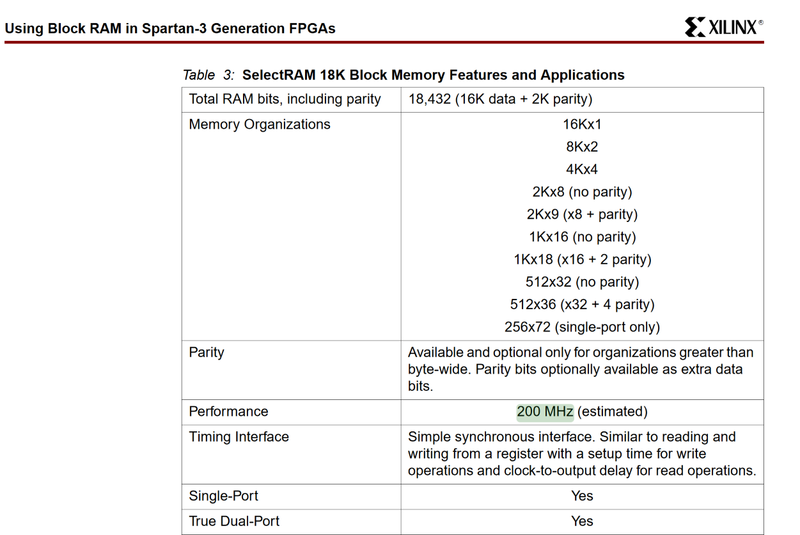 For the most part, memory on the TPU ‘System on Chip’ is made up of Xilinx Block Rams. These are 2KB in size, and dual-ported, allowing them to be used as VRAM and TRAM (for an explanation of TRAM see the previous part in this series of posts). 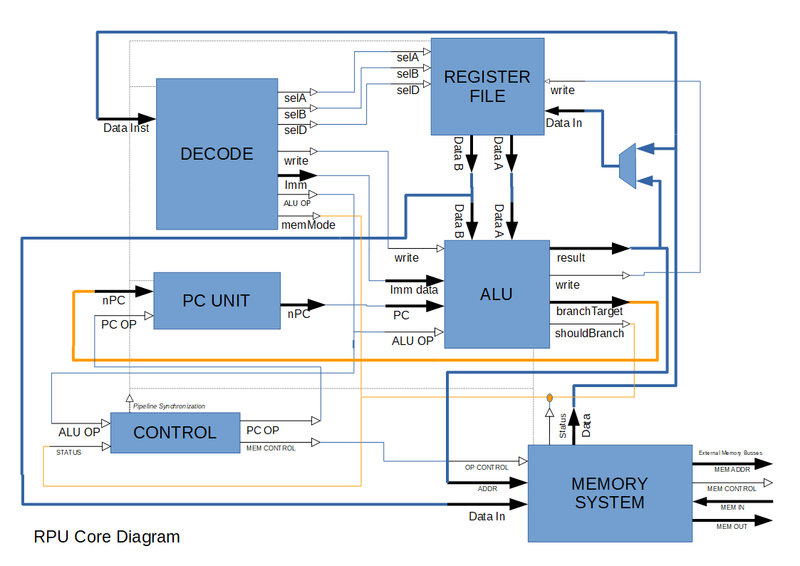 The rest of the memory subsystem is addressing logic for memory mapping the UART, switches, LEDs, and other peripheral I/O. Due to most memory blocks being 2KB, memory is divided up into 2KB blocks/banks. The address bus selects a bank, which has it’s own chip select line. We have signals for the masked off address within any given bank, and the bank ID. We could implement all of this with bidirectional/tristate signals, but maybe that’s a discussion for another post. I’ve intentionally kept bidirectional communication to the minimum, as it can easily cause confusing situations. So you can see it’s fairly easy to move things around and see how to attach block rams into the TPU ‘memory map’. But we also have I/O! Part 9 showed how memory mapped I/O was handled, and that does not change at all. There is a process in the top-level module which monitors for memory requests at certain addresses, and manipulates the IO_DATA signal in the case of any memory reads. You can see above that the data into TPU selects IO_DATA when no memory selects or interrupts are active. If we add another peripheral, we simply edit the process hanling this part of memory to update the relevant signals for any given address. You’ll notice that the chip selects above don’t map all banks to block rams just now. It would be useful to know about memory locations that are not currently mapped, and that should be a simple case of making sure a chip select line is active on a memory command. If a chip select is not active, we can assume the address is unmapped, and request an interrupt to the TPU core. First, we need to OR together all those chip select lines into one allseeing MEM_ANY_CS signal. Then, we check that signal in the I/O handler process – and if it is ever inactive during a memory operation, we know that we’re accessing unmapped memory. In the code above, whats missing is that at the end of the memory command, we de-assert the MEM_Access_error signal. This means that if another process sees this MEM_Access_error signal as active, we can use that to request an interrupt. This is what the memory interrupt process checks for, and acts upon. This process checks each clock cycle for a memory access error, and if it notices one, it requests an interrupt, and saves the current memory bank into the lower half of the INT_DATA signal. This signal is what becomes the Interrupt Event Field, which is accessible in user code. We set he high byte of this to 0x80 – to identify the interrupt type to the interrupt handler. The rest of the code in this process is simply following the exception workflow – it waits for the interrupt acknowledge, and then waits for cycles of latency before completing. With these changes, it now means if an un-mapped memory access occurs, our interrupt vector code is called, and when we issue the gief instruction to obtain the Event Field into a register, we’ll be able to know it’s a memory violation – and what bank the attempted access came from. 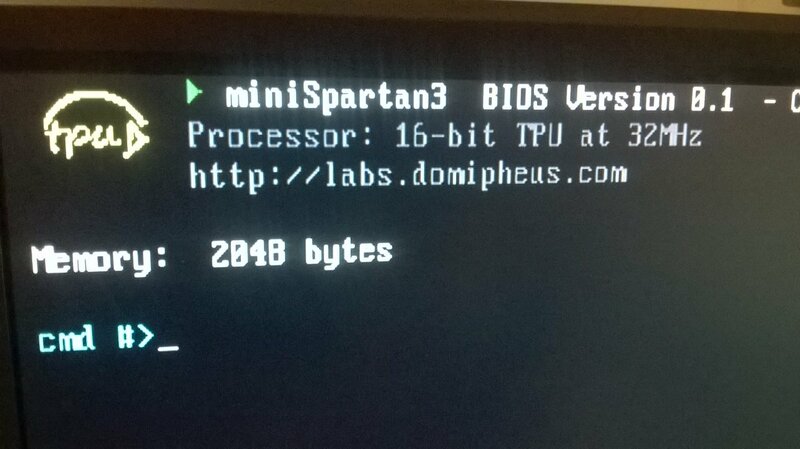 At the moment, when printing the bios header (using a custom glyph set for a TPU logo), the size of this code amounts to around 1.1KB – which is pretty massive when you think about it. You can see in that above image a memory figure – and this is checked at runtime. It iteratively searches through memory, reading every byte location, until an unmapped memory violation occurs. The memory test assumes that the first contiguous block of ram is the usable memory. With 8 2KB block rams connected to those first bank addresses, we have 16KB to play with. This memory test really brought back old memories of how long you sometimes had to wait for the memory test to complete. The uitoa function relies heavily on divide/mod operations, and with software-only divide, things are slow. It’s a few seconds to work through that 16KB window. 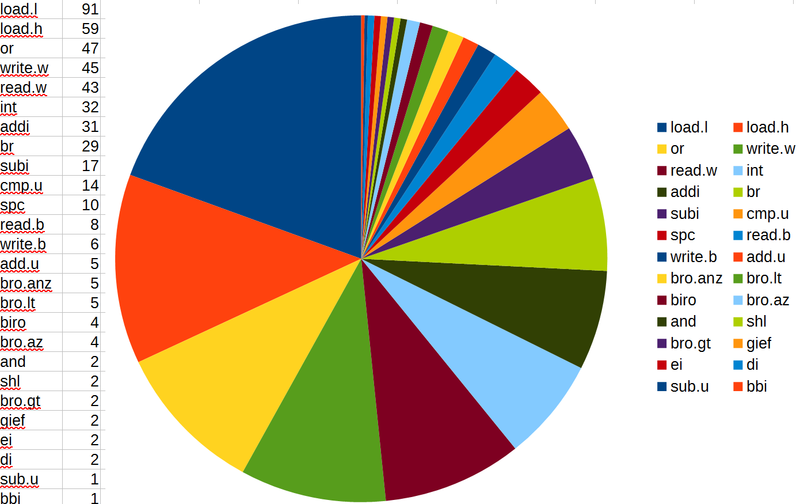 But, I quite like the fact it is slow enough that you can see the searches happen in real time. With that, I was tempted to integrate a startup beep like old times. And, well, I’m going to do what @mmalex tells me to do in this instance! The audio is a simple square wave through the headphone jack which I’d forgotten existed on the miniSpartan6+ board. I now have a memory-mapped register which controls it’s operation, allowing you to activate the left or right output channels. I’ll add the ability to control the tone later – for now, it’s just a cool bios beep! That pretty much explains the current memory subsystem in a bit more detail, and hopefully shows that TPU is now starting to really behave like an old vintage computer. I aim to develop the BIOS more, and have another post up my sleeve talking about a new instruction, and further BIOS progress. Thanks for reading, as always let me know your thoughts via twitter @domipheus.